While out showing homes in Carlsbad and Encinitas this past week, my client and I were taken aback by a new urinal that had been placed in a recently remodeled Carlsbad home. 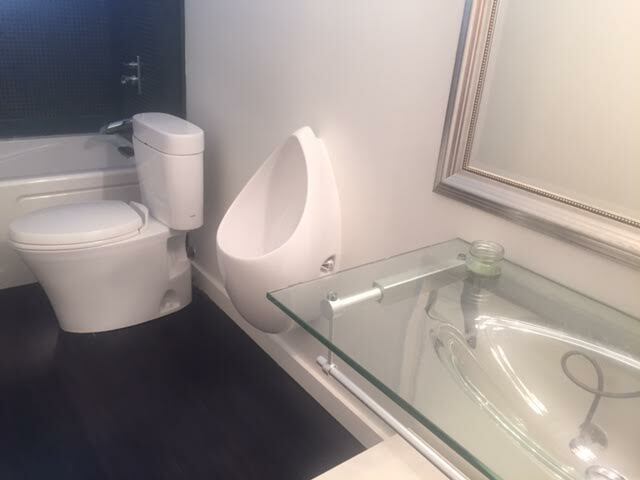 This is the second time I have seen a urinal in a home for sale in the past few months. I can’t help but wonder if it’s an emerging trend–or was perhaps installed by some frustrated mother/wife as a way to keep the toilet lid down. Or it could have been the parent(s) of a household filled with boys. Women (or the vast majority) absolutely HATE the idea of a urinal in their home. They worry about the smell almost as much as the idea of cleaning a urinal. Thumbs down by this group of Realtors. Men (or the vast majority of those who weighed in) LOVE the idea of a urinal in their home. It’s an appliance they know and with which they feel comfortable (or so I presume). The male group of Realtors gave the idea of a urinal thumbs up. I raised three sons. Had we had a urinal in our bathroom, when they were young and slight too short for an accurate aim, they would have tried anyway–and missed. As they did with the toilet. But this appliance would seem to invite even more of the toilet “sword fights” they enjoyed so much–and that brought screeching from me. Later on, they might have appreciated it , but they are not the toilet-cleaning sorts. I would dread leaving the task of urinal cleaning to anyone–including myself. I have an obvious bias. What is your opinion? Is it a worthwhile upgrade? In this case, the urinal pushed the toilet too close to the tub–and more space is obviously needed. And while on the topic of urinals, can’t help but recall that fun nigh in Prague several years ago, when son Mark snapped this very funny photo in the men’s room!